World Cup 2014. Yes, that is the main reason we are in Brazil. We could not pass up the World Cup especially in Brazil…even though it is breaking our budget big time/budget thrown out the window. The World Cup is such a beautiful thing. People from England, Columbia, Brazil, other people from USA to name a few, are suddenly your friends and you are having drinks with them and making contacts left and right. It brings everyone together. Chanting on the streets, singing in the Metro, fireworks throughout the day when Brazil played, costumes, starting USA chants in Brazilian steakhouses, crazy South American fans, packed bars, and the city shutting down was great to experience. 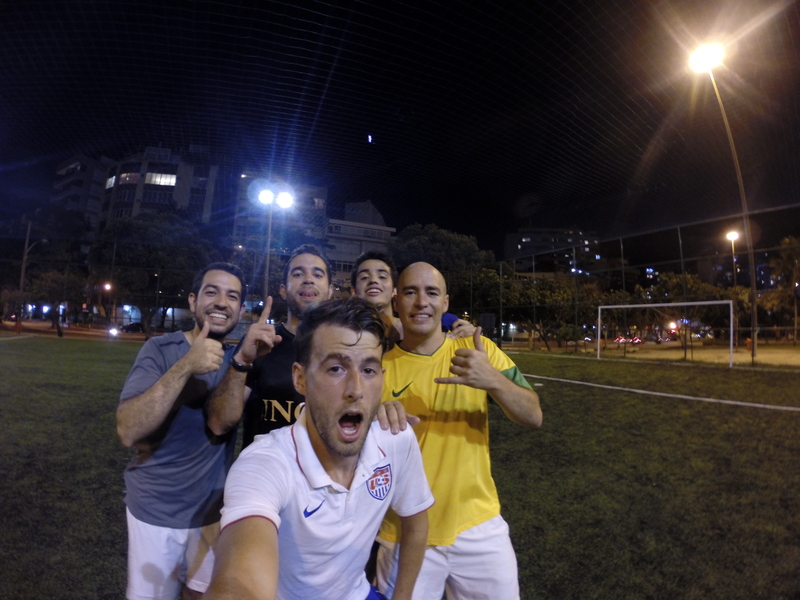 We went to watch Brazil play Columbia in a bar right outside the Maracana. We didn’t want to risk not getting a table elsewhere 2 hours before hand so we walked to the real Brazilian experience. A bar with two TV’s on the corner of the street with everyone standing on the sidewalk. Traffic was stopped, and everyone was honking their horn for at least 30 seconds each. I don’t think traffic moved much at all for the hour before the game. There was at least 70 police officers outside the bar circling around something. We later find out that the police station shut down for the game and the station was across the street from us. We heard huge cheers from the station 3 seconds before we saw Brazil score, obviously our TV’s were a little behind. Fireworks go off for the goal and the bar erupts. The streets are dead. No traffic for two hours, not even a car passes by. I don’t know how to explain it. The streets were completely packed and crazy before the game, then 5 minutes into the game nobody was on the roads, no buses, no taxis, no cars, completely empty. A few days before when Brazil played their round of 16 match, we had to be rushed out of the mall because every store was closing before 12 PM. It was a beautiful thing seeing the city shut down. We also joined a few pick up games, which was a must do for me. We walked to a field right by the Lagoa around 6 PM and noticed girls were scrimmaging and after a long walk this was not what we wanted to see. We noticed some people waiting on the other side of the fence to we figured the scrimmage might be over soon. The guys on the side of the fence were 12-20 years old with amazing touches. After the girls were done two groups ran onto the field. Somehow everyone already knew what they were doing except us. We asked someone how this works, who gets to play and how often. All we could gather that you have to form your own teams of 8. So we asked around and didn’t have much luck fitting in especially with none of the kids speaking any english. After two 10 minute games, one guy motioned to us, dois jogadores, me and Diego ran on the field with no hesitation. Some were playing barefoot some weren’t, but most had great control and skill. Diego gets the ball passed to him and the first touch he takes one of the barefoot kid slides into his shins toes first and Diego takes about three tumbles. I was cracking up, these kids came to play, each challenge was not easy with all 50/50’s being crunching tackles barefoot up. We played one game with them, got accepted to come back and play with them again…we think, and then another group took over and we played with them. We got lucky and got into some games, but most groups even though they are playing on public fields don’t like newcomers to join their groups. You have to do a lot of waiting before possibly getting in but it was definitely worth it. Playing under the lights, with the Brazilian kids, cars passing on the road next to us, and the view of Christ lit up right above the field is something I won’t forget. Futebol is a beautiful thing and the World Cup has been filled with amazing experiences so far.